My wife and I spent a lot of time coming up with wedding gift ideas for our family and friends. As a DIY'er, of course I couldn't just buy something ready-made. I wanted to make something special and handcrafted for them. That was when the idea of coasters came to mind. The budget was also a concern, so making something was the more affordable way, but would also be more memorable and meaningful. 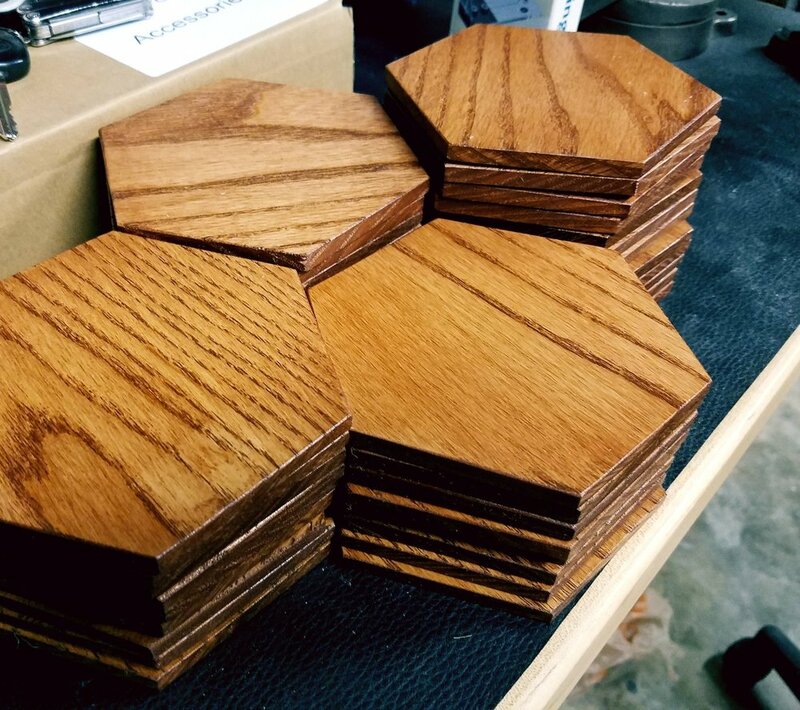 You can make the coasters to any size you wish, but I decided to make ours 5" from point to point, or 4 5/16" from edge to edge. A hexagon has six sides with six angles each at 30 degrees, so you just have to make sure all the sides are the same length and all the angles are 30 degrees. I started by cutting down the wood pieces to 5" lengths for easier batching. Then I set the miter gauge to 30 degrees and clamped down a stop block to set the length. Cut one edge, flip it over and then cut the other side. Once you have one side cut, turn it over to the other side and make the same 2 cuts again. You should have a perfect hexagon now with six 30 degree angles. I ended up making about 200 hundred coasters so all of the cutting took quite awhile! 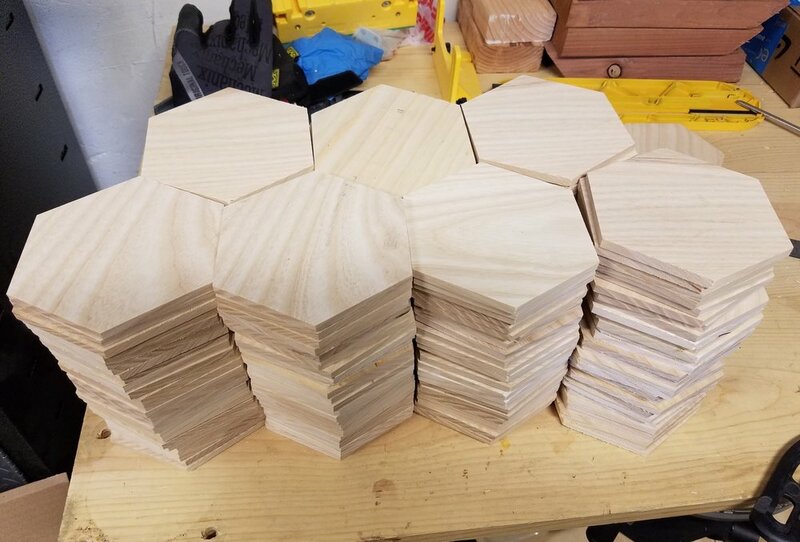 Once everything was cut, I lightly sanded the coasters with 220 grit sandpaper. Then I stained the coasters with Minwax Early American stain. Just wipe on, let sit for 5 minutes, then wipe off the excess. Next I sealed the coasters with Minwax Polyurethane Spray. You can use a brush-on version, but with 200 coasters to do, the spray version was the fastest and easiest way. Lightly sand with 220 grip sandpaper after the first coat and wipe off the dust. I did a total of 3 coats per side. The embossing gives the letters a raised texture, and gives it an overall premium look. It is also more durable than just regular stamping. We got a custom stamp made, but you can use any stamp of your choice. Clean the surface of the coaster and wipe it clean with the Embossing Magic pad. This prevents any stray embossing powder from sticking to the coasters, and potentially making a mess. Next press your stamp firmly onto the embossing ink pad and stamp your coaster. Use even pressure and make sure you get good contact. Then sprinkle your embossing pigment over the area you just stamped, making sure you get full, even coverage. Next, knock off the excess powder, leaving you with just the stamped part covered in powder. It is VERY important to clean off any excess powder in the non-stamped area before applying heat. Now with your heat gun, use even strokes and heat up the powder. It should slowly melt and adhere permanently to coaster. Be careful not to get the powder too hot (stay about 6-8 inches away) or else you can get bubbles. This takes a little bit of getting used to, so I suggest you practice on some paper until you get the hang of it. We used some twine and tied a little message onto the coasters. 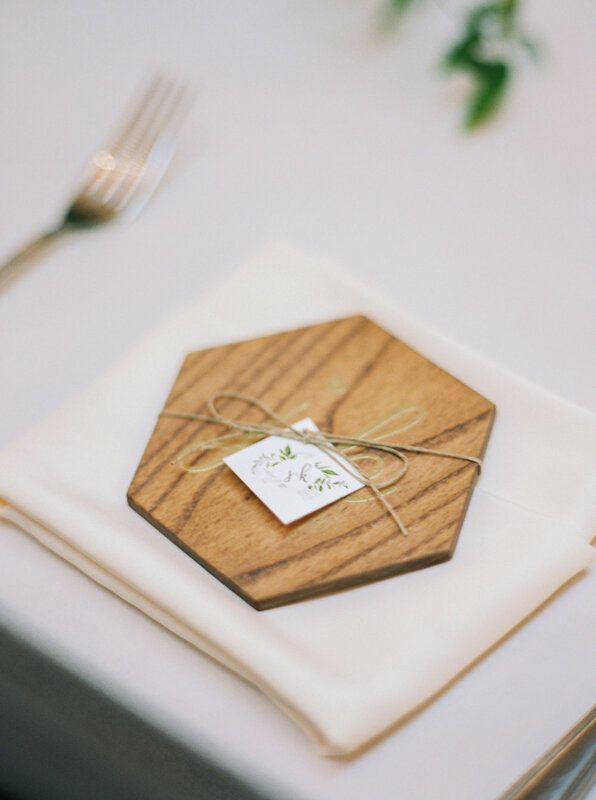 No two coasters were alike since the wood grain pattern on each piece was different. 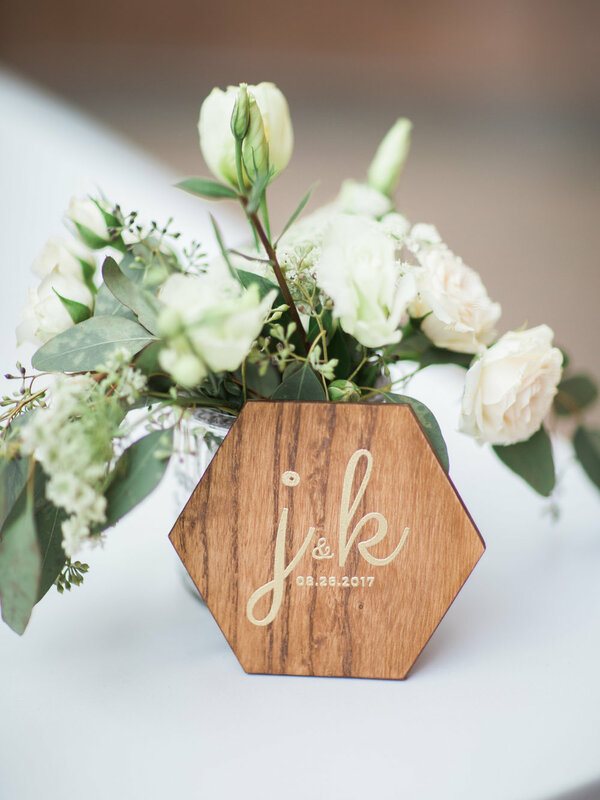 Our guests loved it and we were happy to create something special and unique for them.